First we will learn about AD or Administrative Distance. Administrative distance (AD) is a router’s feature to choose best way when there are two or more than way to reach same destination with two different routing protocol. 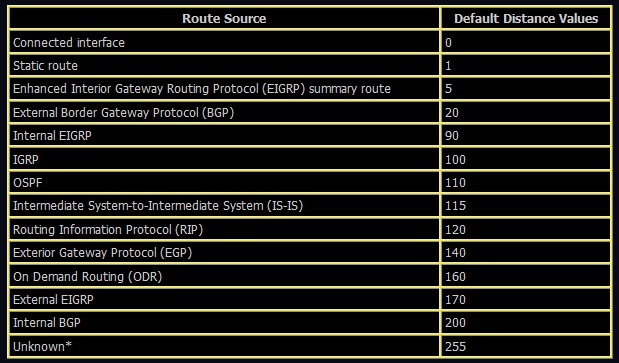 Administrative distance shows reliability from a routing protocol. Every routing protocol being priority from another with value Administrative Distance (AD) Help. The more smaller AD, the more high the value. If there are two or more routing protocol that run and send to same network, routing protocol will being choose with the smallest AD. Please click in a picture to enlarge the picture. In Routing protocol, u also must know about Load Balancing. Have u ever heard about Load Balancing? Load Balancing is distribution of traffic to two interface or more with same network destination. Load Balancing is divide with 2 type: Equal Cost Load Balancing and Unequal Cost Load Balancing. if there are more than 1 way send to same network destination with same metric, the traffic load will being divide equal. if the metric is different, it must being done with routing protocol (IGRP & EIGRP). To show in a network using load balancing or not, we can use command “show ip route”. Let’s take a break a little. after this, we will continue explain more about Distant Vector Routing Protocol.